Livin' the Dream: Can you believe it? Can you believe it? I almost have a one year old child! It is boggling my mind! Not only that but he is walking, too! Isaac's first step was on December 20, 2009 (This is for my personal records, thankyou) He has been full on walking for about 2 weeks and all of the learning and getting confident happened in between, of course. This last year has been the most remarkable of my life. I gave birth to, and have kept alive, one very wonderful little human being. He makes me laugh daily. Isaac is incredibly good at flirting and making every lady around him smile. I overheard my sister-in-law saying that "flirting isn't taught, it is just known and Isaac knows how to flirt!" Isaac has a very mellow and easy-going disposition. Most of the time he is very pleasant to be around. He is good at giving what we like to call a "tight sqeeze." It is what it sounds like. He wraps his little arms around our necks and squeeze's tight. Today at the store he made me a little bit upset because he wasnt' staying with me, (He is very adiment about walking on his own) and in seeing this he quickly gave me a "tight squeeze" to remedy me. How could I be upset after that? Isaac has finally had two little bottom teeth come in, and with that some long nights and crying! Poor guy. 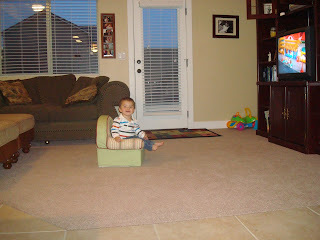 There has been lots of baby motrin, cuddling, and watching "Little People" to help calm those aching gums. 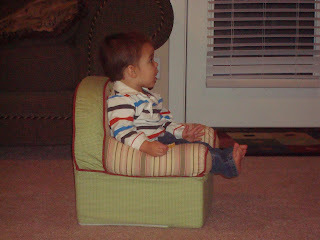 Below are some pictures of him in his little chair he got for Christmas watching his movie. Hope you enjoy....and sorry that I haven't posted in SO long. HOLY CRAP!!! When did he start walking?!?! I swear it hasn't been that long since I saw you guys last. Oh my goodness! I'm gonna cry! I can't believe he is walking!!! I knew he would be, but to see him go...oh my goodness. He is such a little man. 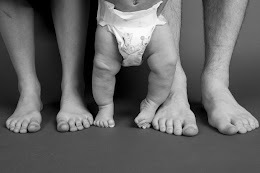 And a very cute one, at that! 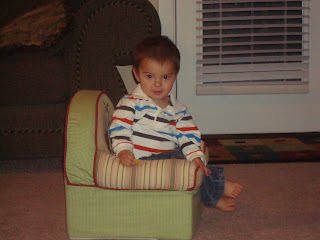 I just can't believe how big he has gotten. He was so very little when I last saw you...sigh. Seeing your house makes me very homesick. I wish I were your next-door neighbor still. I miss you, Mary.